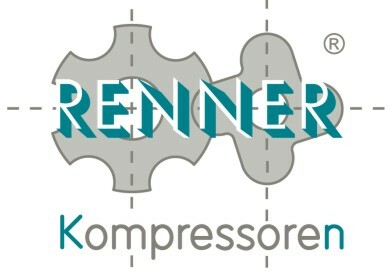 The models in the RSK and RSDK ranges presented here are based on RENNER’s standard RS series and designed for industrial use. These models come equipped with a compressed air refrigeration dryer. This is fitted on the housing and its output is matched to the respective flow of the compressor. The entire system is assembled and ready for connection and operation. In contrast to the space required and costs incurred by installing separate compressor and dryer units, this system has major advantages in terms of its installation costs and space requirements. The compressed air is delivered to the refrigeration air dryer for conditioning and pre-cooling in the air-to-air heat exchanger. This pre-cooling process takes place counter-current to the outgoing cool treated air. No additional energy is required for this. The air is cooled further still to the pressure dew point in the refrigerant-to-air heat exchanger which is cooled by a refrigerant circuit. Throughout the cooling process, moisture in the form of condensate is precipitated out and automatically discharged from the system. Before it is emitted, the conditioned compressed air is reheated in the air-to-air heat exchanger by the incoming hot compressed air. RENNER refrigeration dryers are environmentally sound and run on the ozone-friendly refrigerant R134a.